Oasis of the Seas which along with its sister ship is the largest cruise class in the world has completed its 14-day drydock with brand new features and experiences. On October 14th the huge vessel will begin to offer an even better cruising experience to its guests. Some of the new features include re-imagined dining, game-changing high-speed internet, exciting new retail offerings, a new popular and favorite Broadway show, new suites with exclusive suite dining and lounge. Royal Caribbean’s Dynamic Dining, allows guests to tempt their taste buds with more choice and flexibility than ever before by offering guests a landscape of 20 restaurants, as vast and varied as dining in the world’s most cosmopolitan cities. Royal Caribbean has recreated the original Oasis-class three-story main dining room into three distinct complimentary venues introducing bold new concepts each with their own cuisine and ambiance. The three venues inlclude American Icon Grill, Silk and The Grande. Guests will enjoy menus of the new concepts beginning March 14, 2015, onboard Oasis of the Seas. Guests sailing Oasis of the Seas prior to March 14, will enjoy the traditional dining room experience in the newly designed spaces. As part of Dynamic Dining guests will have full control of their own epicurean journey with a tantalizing selection of specialty restaurants including four new unique concepts. Boatloads of Bandwidth, the game-changing partnership with technology partner O3b that will offer guests onboardOasis of the Seas and Allure of the Seas connectivity that matches fast broadband connections onshore and is greater than all other cruise ships combined. Oasis of the Seas’ introduced the first-ever, fully-licensed Broadway show at sea and now, the ship will bring one of the longest running productions on Broadway, Andrew Lloyd Webber’sTony award winning CATS to sea for the first time. Beginning June 2015, sister ship Allure of the Seas will feature MAMMA MIA!, the smash hit musical based on the story-telling magic of ABBA’s timeless songs. Known for its first at sea offerings, Royal Caribbean is introducing the playfully sophisticated designs of kate spade new york to Oasis-class on its popular Royal Promenade, a first at sea. Rounding out the diverse onboard shopping are two guest favoritesMichael Kors and the Britto Art Gallery, as well as a whole new line-up of merchandise and fashion jewelry such as, Alexis Bittar, Uno de 50, Lauren G Adams, and Nina Nguyen. 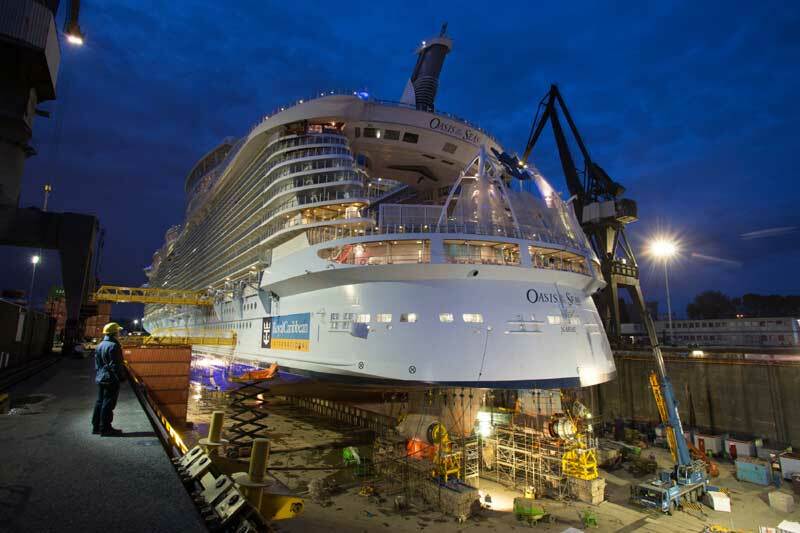 Oasis of the Seas had spent 14-days in Rotterdam for its drydock. Sister ship Allure of the Seas will also undergo a drydock in May 2015 with the same enhancements.